Theo Schreurs (Nijmegen , 18 May 1939) studies at the Academy of Visual Arts. He starts his career as a schoolmaster and later on becomes a handicraft teacher at a secondary school. In addition he performs as a mime-artist and manifests himself as a stage director. In 1970 he takes up sculpting. His figures are moulded in clay and then cast in bronze. In the early seventies his sculptures in public places gain regional acclaim in the provinces of Gelderland and Overijssel, and form a sculpture-route of chiefly early work in this region. 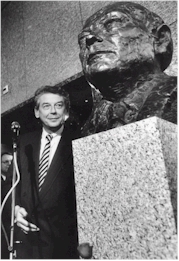 The Partij van de Arbeid’s acquisition of Schreurs’ bronze portrait of ex-prime minister Joop den Uyl earns him national recognition as a sculptor. In 1992 this portrait is placed in the building of the Second Chamber in the Hague. After the portrait of Joop den Uyl Schreurs receives commissions throughout the country. For Centrum 40-45 he constructs a sculpture that is placed as a monument for the relatives of victims of the second world war. In 1995 he makes a big sculpture for the municipal offices in Breda. He also receives commissions from Philips Winterswijk, Stichting tot het Nut van het Algemeen in Deventer and Ruhold in Deventer. The style of Schreurs’ sculptures has undergone a clear development. In his early period it was chiefly figurative, but in his later years he has changed this realism for a more expressive approach. Though his sculptures have remained basically figurative, they allow themselves broader, fanciful liberties and breaches of the rules of realism. The recurring theme of the sculptures is the accentuation of gravitation, which causes a contrast between earthly things and space. 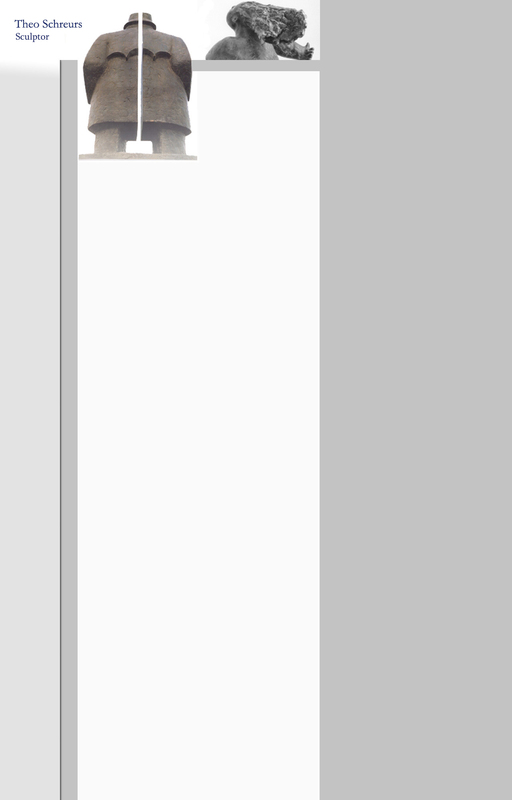 Thus Schreurs represents “the portable lightness” as he himself calls it. By this broader freedom of expression Schreurs has also developed a personal form of realism.